2015 Road Trip Photos #8: The Other Birmingham Park « Midlife Crisis Crossover! 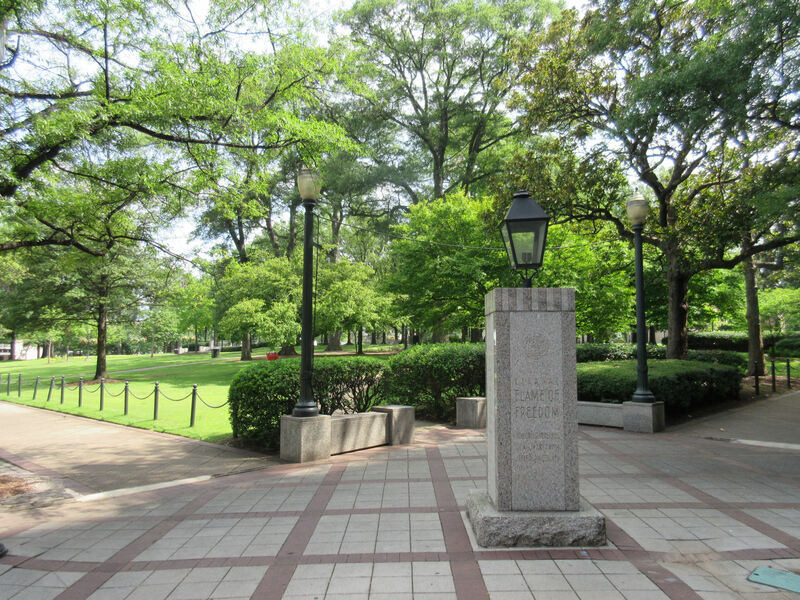 In the last three chapters we walked through Birmingham’s Kelly Ingram Park, which hosted some of the most unforgettable moments in civil rights history and today commemorates those struggles and victories in a forthright manner. It would prove to be a solemn experience for us. A few blocks northeast is Linn Park, which has the unenviable job of trying to compete against that weighty reputation for attention from the local citizenry. Not that their adjacency has to be considered a competition, but one certainly had more visitors than the other. 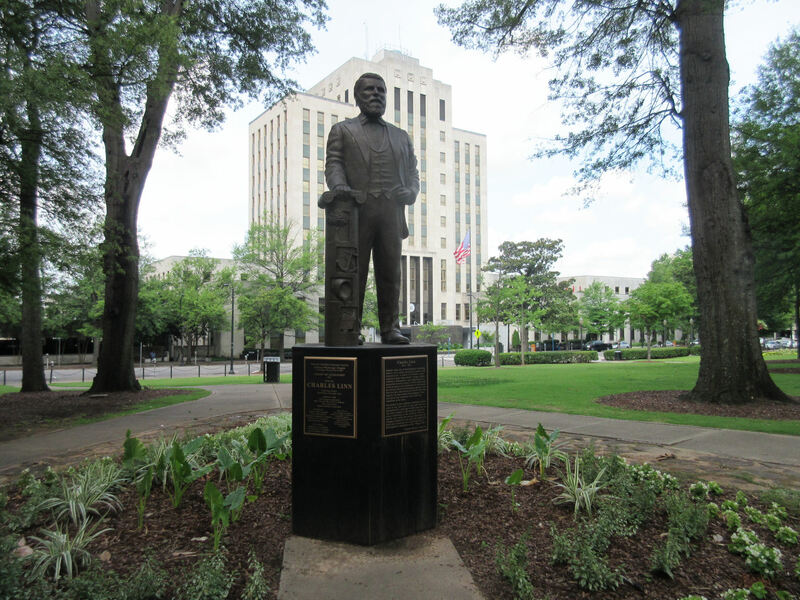 Calling it the Jan Brady of Birmingham parks would be mean, so let’s not do that. We can instead highlight its prominent aspects, its own graven personalities, its own works of art dotting the downtown landscape. Exhibit A, pictured above: the Eternal Flame of Freedom, a 1969 American Legion memorial saluting all Jefferson County war veterans, equipped with a gas jet for burning brightly. The flame was out when we happened by, so I’m taking the “burning brightly” part on faith. To me “eternal” implies 24/7 fire, but it’s possible in this context “eternal” means “three shows daily” and we were too early for the first performance. 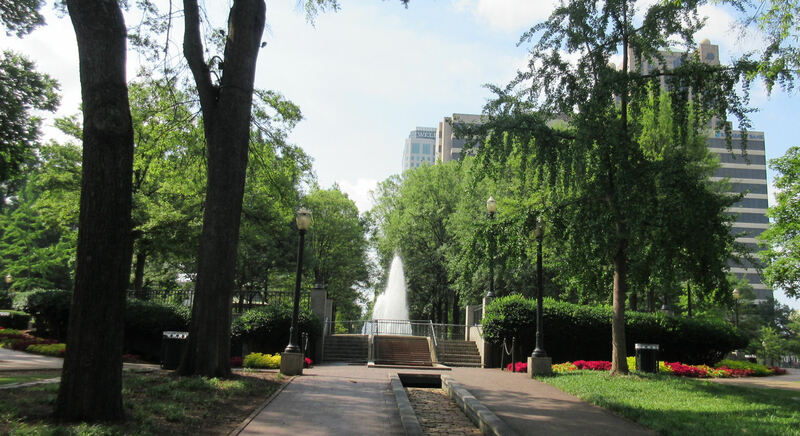 Linn Park has gone by several names, but its current name, affixed in 1988, came from Charles Linn, a sailor, farmer, and businessman who it’s said founded the city’s very first landscaped park (not this one, mind you) back in the 1800s. In 1872 Linn used his earnings to establish the National Bank of Birmingham. Alabama’s first bank founded in accordance with the National Bank Act of 1863. It’s not exactly there anymore. In 1884 it merged with City National Bank to become the First National Bank of Birmingham. In the ’70s it was one of twenty banks to come under the aegis of First Birmingham Corporation and Alabama Bancorporation. In the ’80s, said banks reorganized and became AmSouth Bank, which in turn merged in 2006 with Regions Bank. As of this writing, Regions remains solvent and has yet to be swallowed whole by an even bigger fish. And that’s the story of how Linn Park got its name. Bit of a different vibe from Kelly Ingram Park. 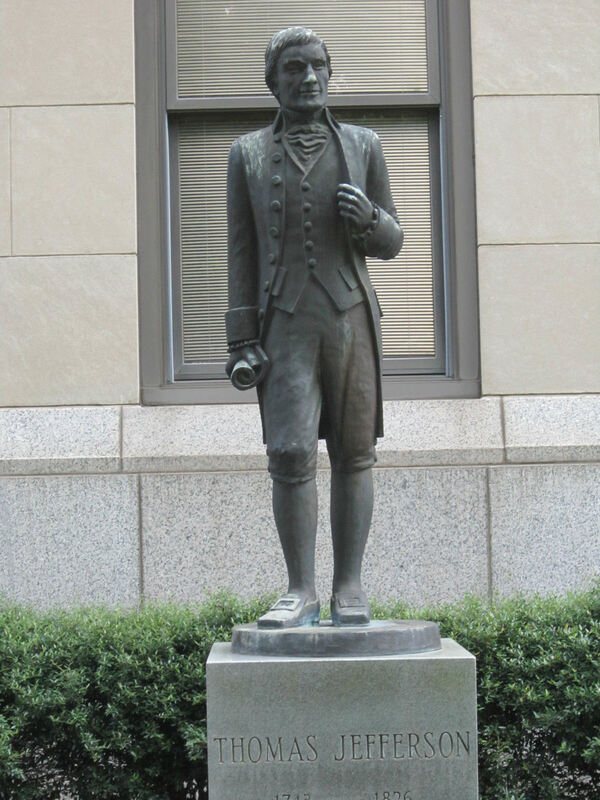 Also commemorated in Linn Park: President Thomas Jefferson, just outside the eponymous Jefferson County Courthouse. After three minutes of sloppy internet research I couldn’t find any evidence that our third U.S. President ever stepped foot in Jefferson County, which was incorporated in 1819, though I hear a rumor some politicians in Alaska are petitioning to have the name changed to McKinley County. 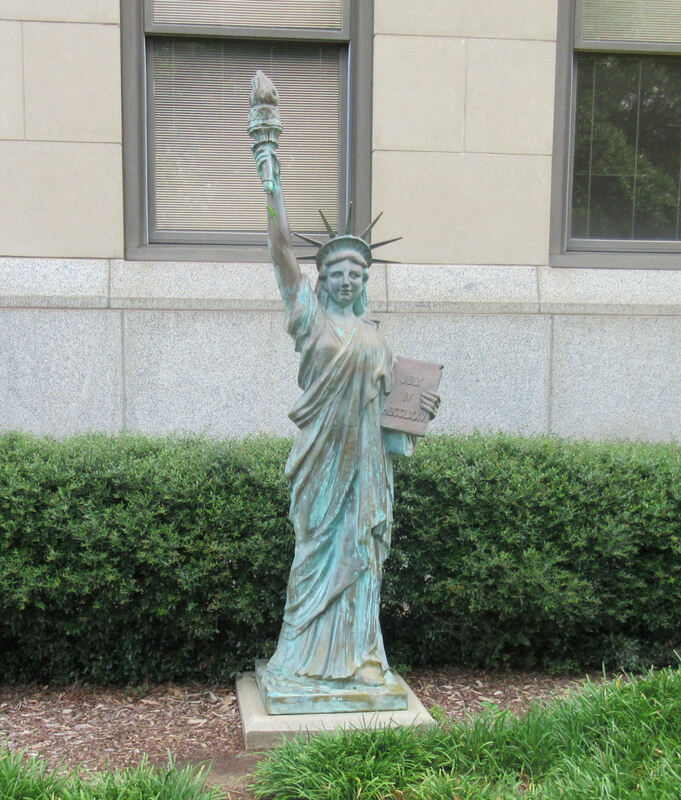 Just down the sidewalk from Jefferson: a Statue of Liberty as tall as three tired, poor, huddled lawn gnomes. On the northwest corner stands a memorial to Raymond Weeks, the WWII veteran who suggested that Armistice Day be renamed Veterans Day so that its observance might encompass all wars, not just WWI. In return he has a permanent plaque noting his outstanding achievement in the field of holiday onomatology. 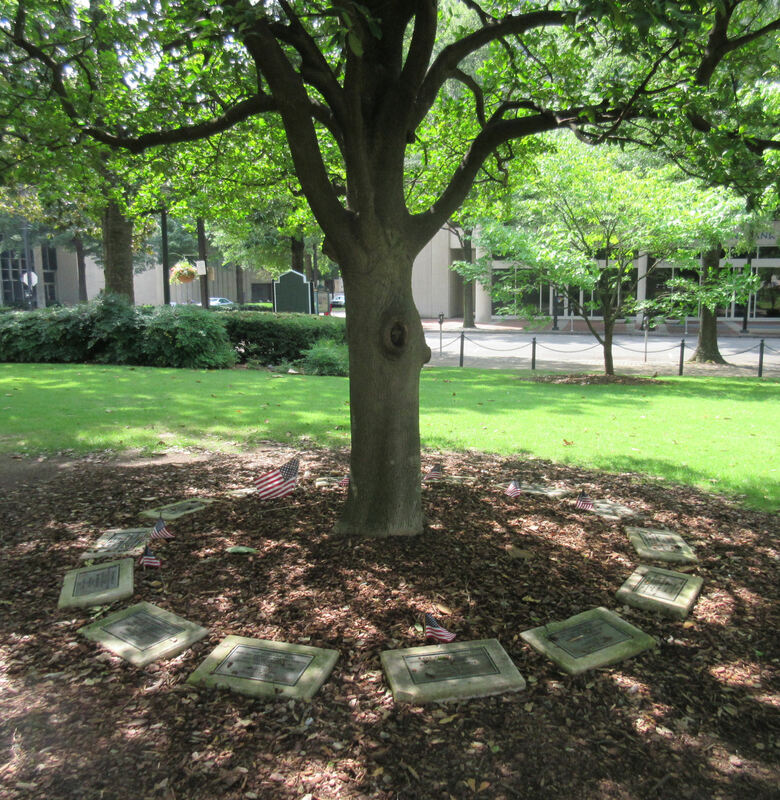 On the south end of the park is a tree surrounded by fourteen plaques in remembrance of local soldiers gone MIA in the Vietnam War. These plaques were thought lost for stolen for some time until last year, when it was discovered they “were accidentally buried under mulch and leaves.” I bet this never happens to the MLK statue over at Ingram Park. 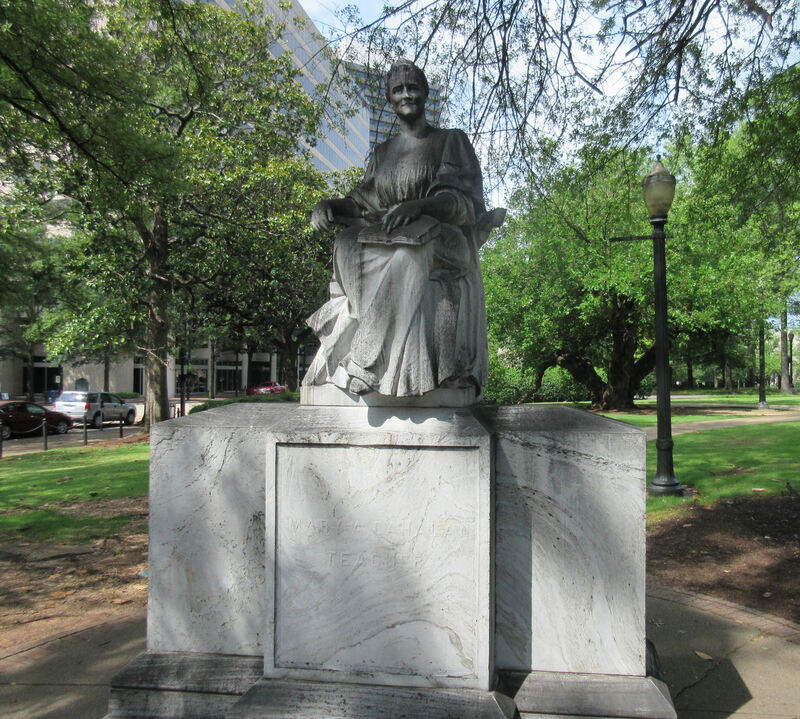 One of the oldest features in Linn Park is this 1908 statue funded by schoolchildren as a collective posthumous thank-you to Mary Ann Cahalan, a beloved schoolteacher and principal who passed away in 1906. The family has posted a copy of her eloquent obituary online that’s more legible than the faded inscription on the rear of the pedestal. 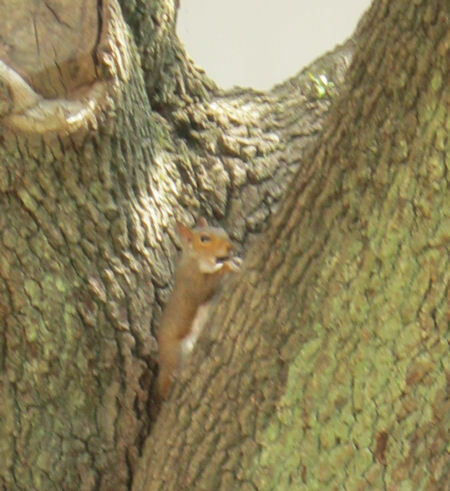 Also in Linn Park: squirrels! 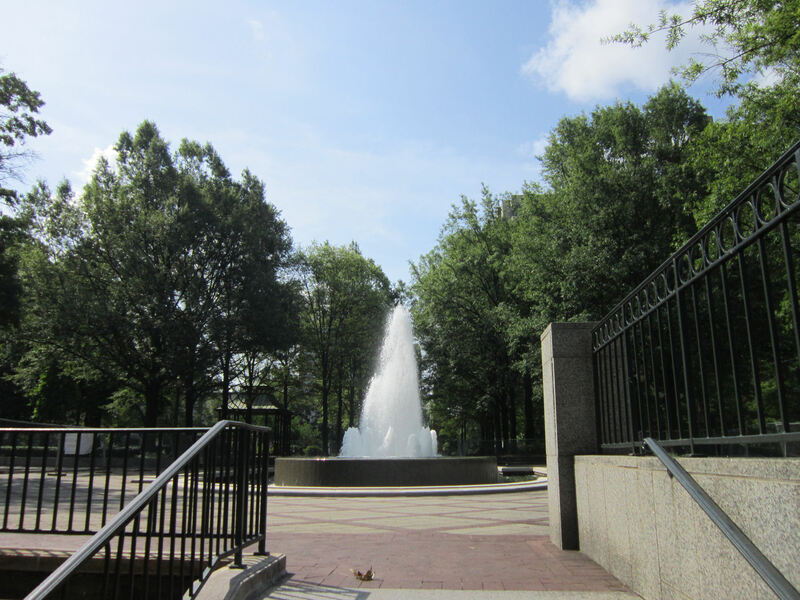 The fountain in the center of the park was installed in the late ’80s, replacing a previous cast-iron version that had stood there since 1891. From a more distant vantage, you can see the gates locking us out and keeping all visitors away from the fountain. I hesitate to ask why such security measures were necessary. But at least the flowers along the sidewalks are pretty and unfettered. 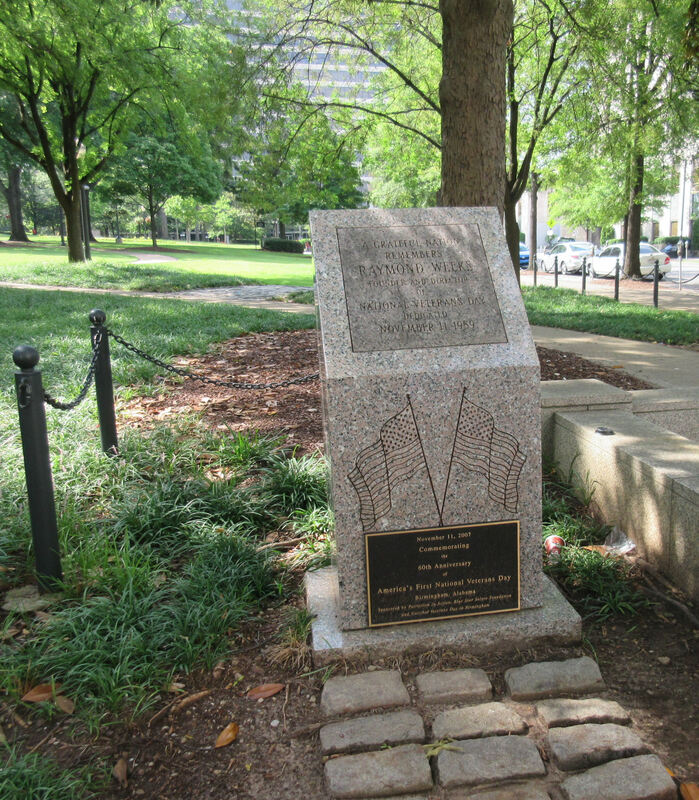 Somewhere in Linn Park there also stands an obelisk called the Confederate Monument, a gift to the city in 1905, but somehow we missed it completely. I checked all our pics from that day, and it doesn’t even appear as an accidental Easter egg in any backgrounds. This may be for the best, considering local officials have plans in motion to dismantle it and get it off their lawn. 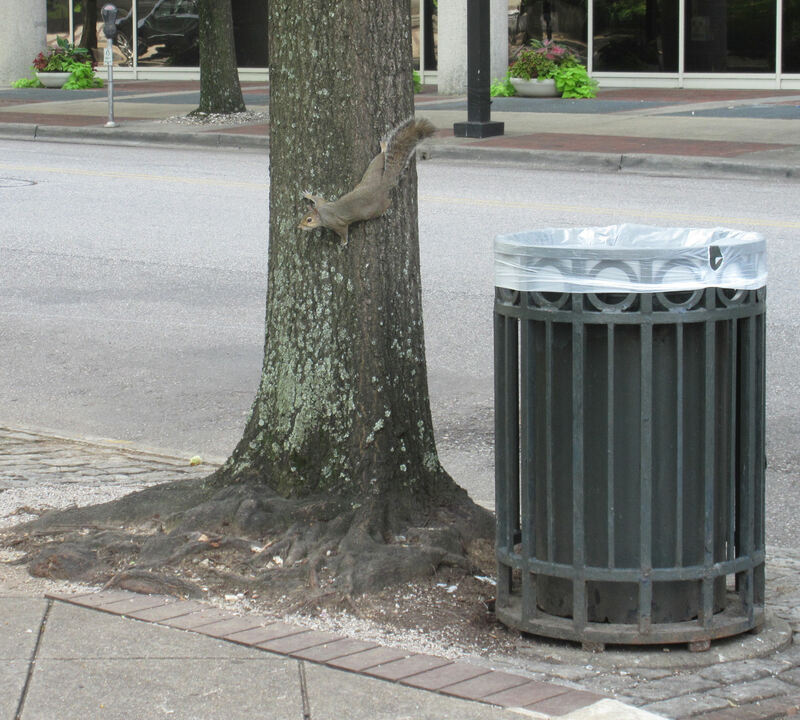 …and that’s the story of why tourists like Ingram Park best.